The Wooly Board is No Longer Available! In her book Stillwater, Alice Starmore writes that "the best method of drying sweaters is on a wooly board" and that she considers it "an essential sweater-care item". A Wooly Board (sometimes called "Woolly Board") is the perfect tool to dry wet wool sweaters quickly and this version is the most solidly constructed and beautifully finished version we have ever come across. This solid hardwood frame is finished with a clear coating and the metal parts are made with stainless steel to ensure the wet sweater does not do any damage to it over time. The Wooly Board is fully adjustable for waist (12-62 inches), shoulders (24-62 inches) and neck. In addition, the arms can be adjusted both close to the body (19-25 inches) and at the cuffs (4-24 inches) allowing the sweater to be perfectly shaped as it dries. The picture below shows the Wooly Board in use. 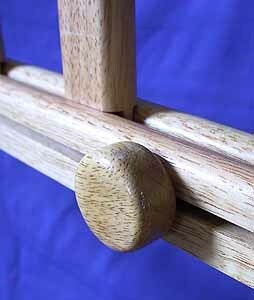 Adjustments to the width of the body and arm length are made by undoing a series of 3 wooden knobs while the base of the arm can be shaped by moving the pegs that hold them in place to a different set of holes. Once the sweater is in place, the sleeve tension can be adjusted using the screws on each side. 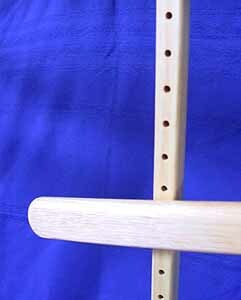 The neck guide provided with the Wooly Board can also be used. Note that in lower cost versions of the Wooly Board we have seen, the width of the sleeve at the armpit and at the wrist cannot be independently adjusted as in this model. This and the ability to adjust the arm length are major benefits of this superior design! 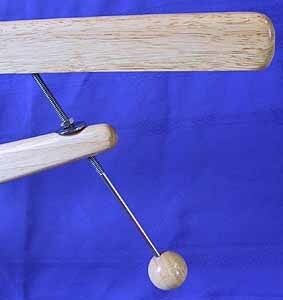 This handy knitting tool quickly collapses when not in use to allow it to be easily stored in a cupboard. When completed broken down it can be stored or shipped in the 4 x 3 1/2 x 46 inch cardboard box it comes in.